Corning this morning unveiled its next-generation Gorilla Glass product, Gorilla Glass 6, which it says offers "unprecedented protection against multiple drops" and better protection against drops from higher heights. According to Corning, Gorilla Glass 6 is its most durable cover glass to date, made of a new material that's been engineered to stand up to more than one drop. The average person drops their smartphone seven times a year, making multi-drop durability a key feature Corning wanted to improve. Devices using Gorilla Glass 6 were able to withstand 15 drops from one meter onto rough surfaces, which is up to two times better than Gorilla Glass 5, which Corning has been offering to its partners since 2016. Competitive glass compositions like soda lime and aluminosilicate, did not survive the first drop, says Corning. The higher durability of Corning's new Gorilla Glass product was engineered with all-glass smartphone designs in mind, like the iPhone X, iPhone 8, and iPhone 8 Plus, offering optical clarity, touch sensitivity, scratch resistance, efficient wireless charging, and enhanced durability. Gorilla Glass 6 is likely to make its way into future iPhones, and could even perhaps be included in the 2018 iPhone lineup, depending on when Corning provided details on the new product to Apple. Corning has been a longtime Apple supplier, with Gorilla Glass used in devices across Apple's product lineup. In May of 2017, Corning even became the first benefactor of Apple's Advanced Manufacturing Fund, receiving $200 million for research and development and new glass processing equipment. Corning says its Gorilla Glass 6 is being evaluated "by multiple customers" and the first smartphones and devices using Gorilla Glass 6 are expected to reach the market in the next several months. Why do phone screens don't scratch until 6-7 level of hardness (youtube tests) but they scratch every time I put them in my pocket? I don't think my pockets have minerals in it, to be able to scratch the display. Personally it feels like later generations of Gorilla glass are more fragile. Gorilla Glass 2 on one of my old android phones survived many a drop. The iPhones the family has had with newer shatters oh so easily. If it didn’t have unprecedented protection they really wouldn’t be doing their job properly would they? WAT. I've dropped my iPhone maybe twice since 2007. The first time was the original iPhone onto asphalt and it only dented the corner slightly. I was a lot more careful after that. The second time was when I was holding two iPhone 6 Plus at the same time and luckily it fell onto carpet because it was my uncle's iPhone. I think my brain was confused holding two giant phones at the same time because I dropped it immediately. I'm still confused about what happened. Fool me once, shame on you; fool me twice, thrice, four times, and five, shame on me. I'd be interesting in seeing drop tests! I think it's small particles of sand? Corning this morning unveiled ('https://www.corning.com/worldwide/en/about-us/news-events/news-releases/2018/07/corning-introduces-corning-gorilla-glass-6-delivering-improved-durability-for-next-generation-mobile-devices.html') its next-generation Gorilla Glass product, Gorilla Glass 6 ('https://www.macrumors.com/2017/05/12/apple-awards-corning-manufacturing-fund-investment/'), which it says offers "unprecedented protection against multiple drops" and better protection against drops from higher heights. 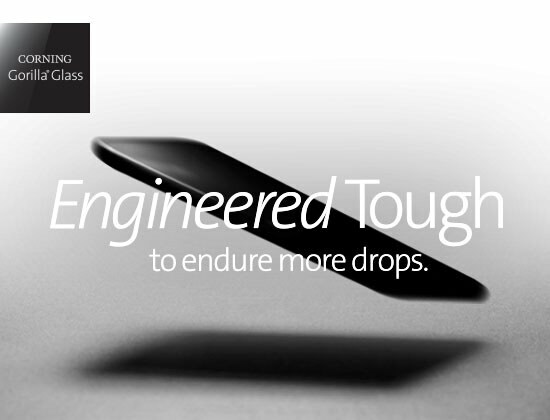 Devices using Gorilla Glass 6 were able to withstand 15 drops from one meter onto rough surfaces, which is up to two times better than Gorilla Glass 5, which Corning has been offering to its partners since 2016 ('https://www.macrumors.com/2016/07/20/corning-debuts-gorilla-glass-5/'). Competitive glass compositions like soda lime and aluminosilicate, did not survive the first drop, says Corning.The higher durability of Corning's new Gorilla Glass product was engineered with all-glass smartphone designs in mind, like the iPhone X, iPhone 8, and iPhone 8 Plus, offering optical clarity, touch sensitivity, scratch resistance, efficient wireless charging, and enhanced durability. Every year the same story from Corning. Stronger, better, less breakable. Then it comes out and worse then previous. That's because it's not Corning but rather some cheap knockoff. Yeah, the problem is we know that Apple uses Corning's Gorilla Glass ('http://fortune.com/2017/10/24/apple-iphone-gorilla-glass-corning/') so there must be another reason Apple is not on this list.